There are so many tropical fish keepers in this hobby today that own or are looking to own the red devil cichlid. These fish hold a very special place in this wonderful hobby. The red devil cichlid also is known as Amphilophus labiatus, is originally from Central America. This cichlid is considered a medium to large cichlid often growing 10-12 inches in their lifetime. Males are often larger and develop a hump on their head as they age. Red devil cichlids are often purchased from pet stores as a small 2-3 inch fish. Many people bring them home to their tank not knowing the personality of this Central American cichlid. This is the reason for this article. I would like to enlighten you on the unique personality of this awesome cichlid. Red devil cichlids are extremely aggressive. Often, males will harass and chase females to the point of death. Many red devil owners choose to give this freshwater tropical fish it's own tank because of its hostility towards other fish. One should be aware of this aggression if you plan to keep multiple fish in the aquarium tank. So many people get attached to this cichlid to only have it turn on them later and kill everything in the tank. If you choose to keep this tropical fish, you will not be disappointed because of their cool personality. Red devil cichlids are territorial and they will protect what they claim as their part of the tank. This space will depend on each individual fish. Some claim a corner of the tank while others claim one-half to more than 75% of the tank. This cichlid will kill and often eat fish that can fit in their mouths. Do not keep this cichlid with any peaceful smaller fish. I would like for anyone that is interested in this cool cichlid to please be prepared to give it a tank of its own or be prepared to find another home for it later if you cannot handle the aggression. These fish make excellent wet pets and will do well in a tank to themselves. The red devil cichlid is often known for jumping and leaving out of the water so ensure you have a tight lid or canopy on the tank. Provide plenty of cover and hiding spaces for this prized cichlid. The Red Devil Cichlid can be hit or miss depending on the individual fish. Either way, you get a very unique tropical fish that can give you years of happiness and entertainment. To read more about freshwater tropical fish please visit Tropical Fish Success. Red Devil cichlids are beautiful fish but they are kept alone because of their very aggressive nature. For aquarists who have previous experience in breeding cichlids, they will find that breeding Red Devil cichlids is no big deal. To prepare for the breeding process, it is best to keep your Red Devil cichlids in a large and decorated aquarium with the ideal water conditions, and feed them with suitable food. One great method to induce spawning in Red Devil cichlids is to increase your aquarium temperature to 24-28°C (75-82°F). Creating a spawning environment for the cichlids is the first important part of the breeding process. What happens in the wild is that the Red Devil cichlids will choose rocks, logs or the ceiling of a cave as the breeding site, and thus, it is good to include such objects in the cichlid aquarium. So, how do you differentiate between the male and female cichlid? You will find that the adult male cichlid has a very obvious bump on his forehead and also a pointy genital papilla. In addition, the male Red Devil cichlid is normally bigger than the female. The cichlids form one-male and one-female pairs and both parents always participate in taking care of their babies. Before any spawning takes place, the male can become more aggressive towards the female. Therefore, it is important for the female cichlids to find many suitable hiding spots in the aquarium to hide from the male cichlid. So to help her with this, you can put a net in the fish tank with an opening that is too small for the male Red Devil cichlid to swim through. This allows the female to escape to a safe place in the aquarium. If not, she may die of injury or become very ill due to the stress caused by the male cichlid. On the other hand, once a bond is formed for a pair of Red Devil cichlids, they are to be moved to the breeding tank. The parents will dig a pit together. After the female lays the eggs which is about 600 to 800 eggs, the male will fertilized the eggs. Once the eggs are been fertilized, both parents will participate in rearing of their young ones. At this time, it is best to leave the family alone. 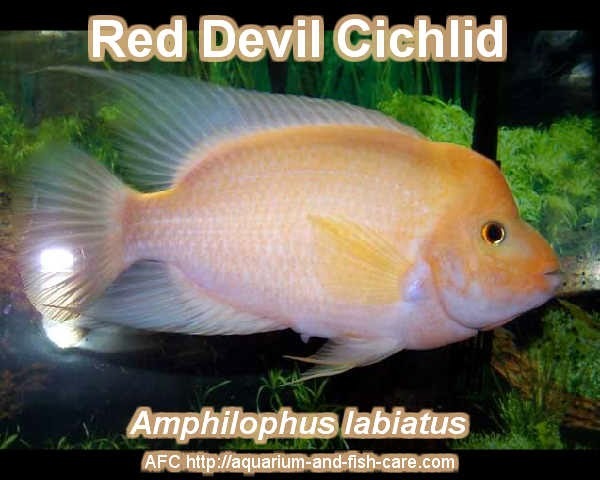 Red Devil cichlids are famous for their aggressiveness in attacking anything which enter their territory especially during this breeding period. The male will guard the territory and the female will tend to the eggs. The eggs will hatch in about 3-5 days. The cichlid parents will quickly move their fry to various pits which they have dug around the tank. These newly-born babies cichlids feed on mucus that are extracted through the skin of the adult fish. Five days later, the fry has grown big enough to swim around the aquarium. Now, you can feed these baby cichlids with small live food.